Discussion in 'Tank Journals' started by Solitaryensis, Dec 11, 2018. The bug never really went away and I spent years trying to muster up the time and energy to get a tank going again, with mostly failed attempts. About 2 years ago, I decided to finally give it a go again with an IM 10. Of course, I outgrew that tank pretty quickly and moved up to a IM 30L. 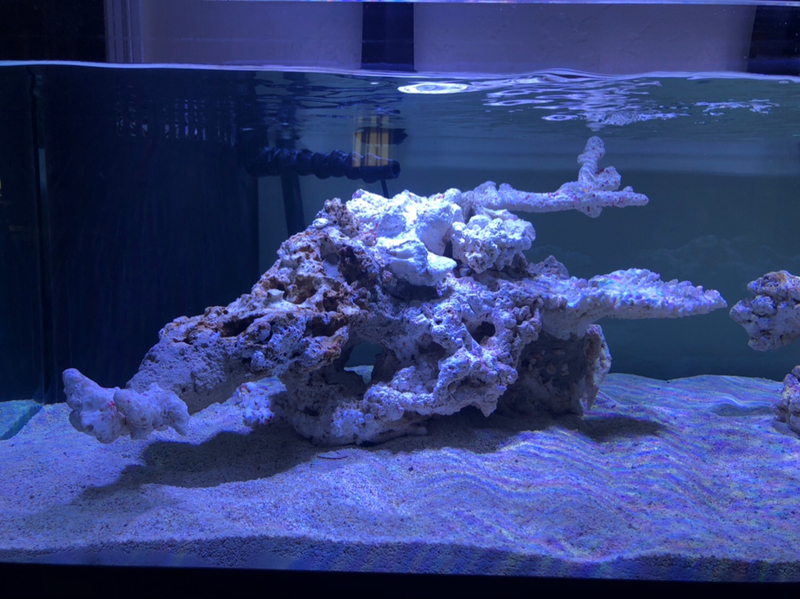 The 30L was up for about a year when I decided to finally work on getting the fina/dream/upgrade tank going. 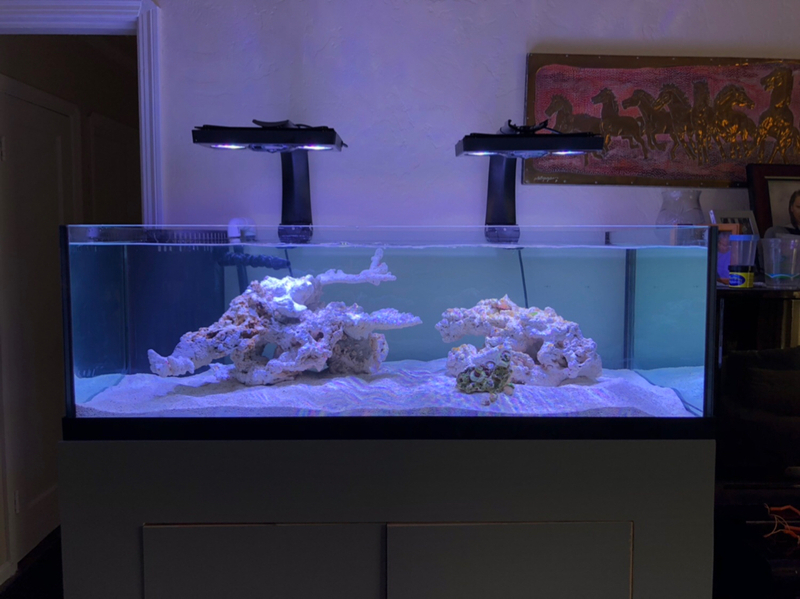 I decided on the Seapora 80 shallow (48” x 24” x 16”) with a DIY stand. The quality on the tank isn’t the greatest but it fit my size criteria and price point so I went with it - crossing fingers that the tank holds up. 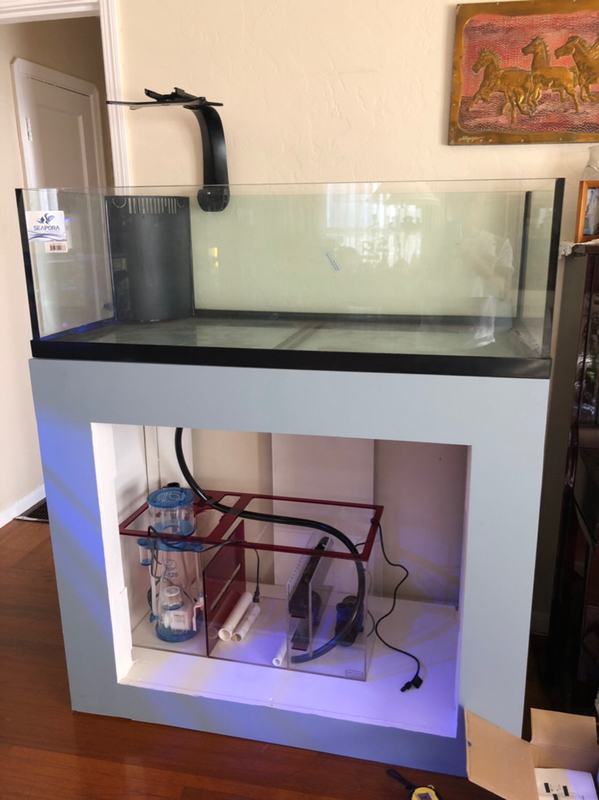 I couldn’t find a lot of information on the tank but some have indicated that Seapora tanks are manufactured by (or in the same factory as) Deep Blue and/or Aquarium Masters. Either way, it’s been fine so far. Here are some photos of the stand, which took me nearly 4 months to build. I live in Albany and commute to work in Mountain View so needless to say, free time is very limited, especially with two younger kids. 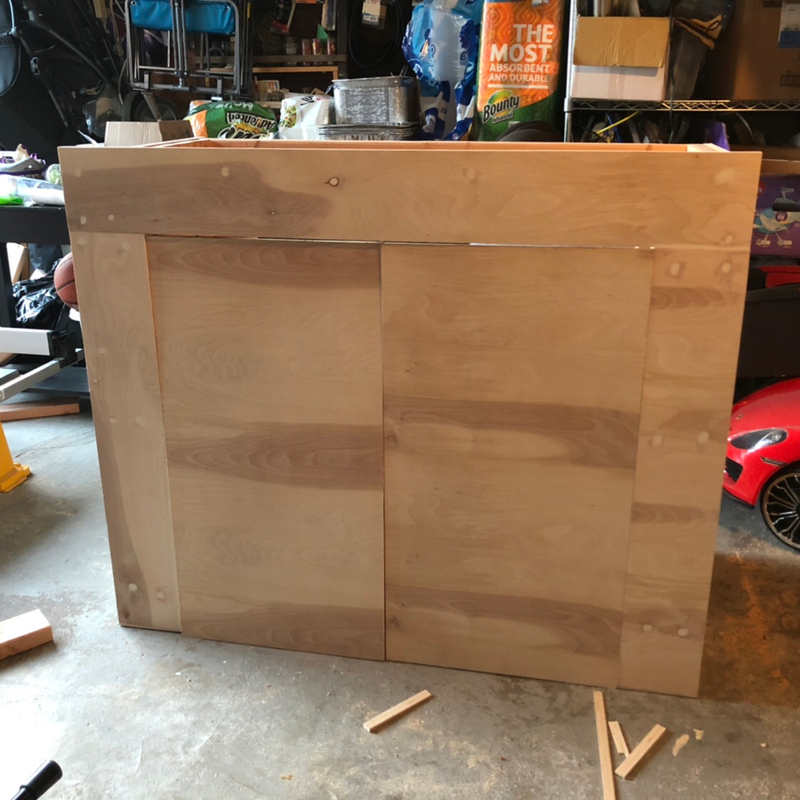 Over the course of the 4 months it took to build the stand, some nights i’d work on it for 10-15 minutes, which became pretty frustrating. Nevertheless, it got done. 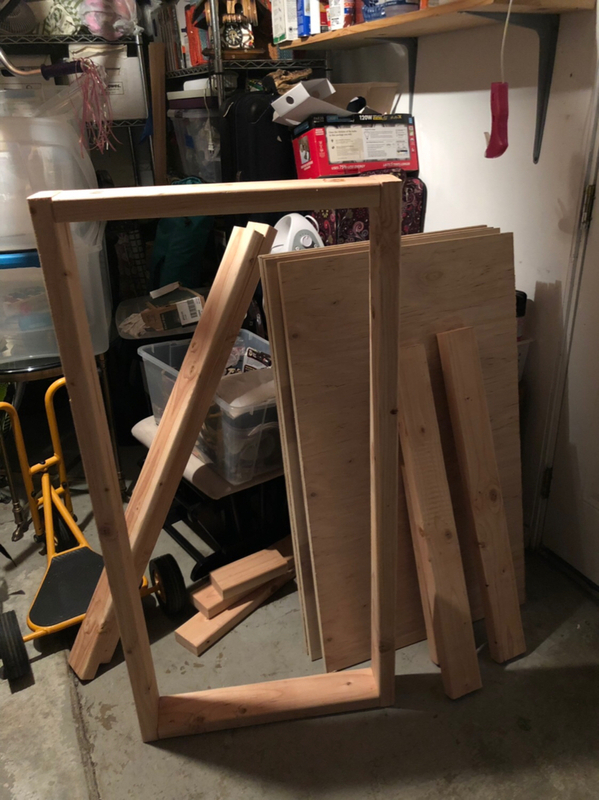 The stand was built with a standard 2’x4’ frame and skinned with ¾ birch ply. 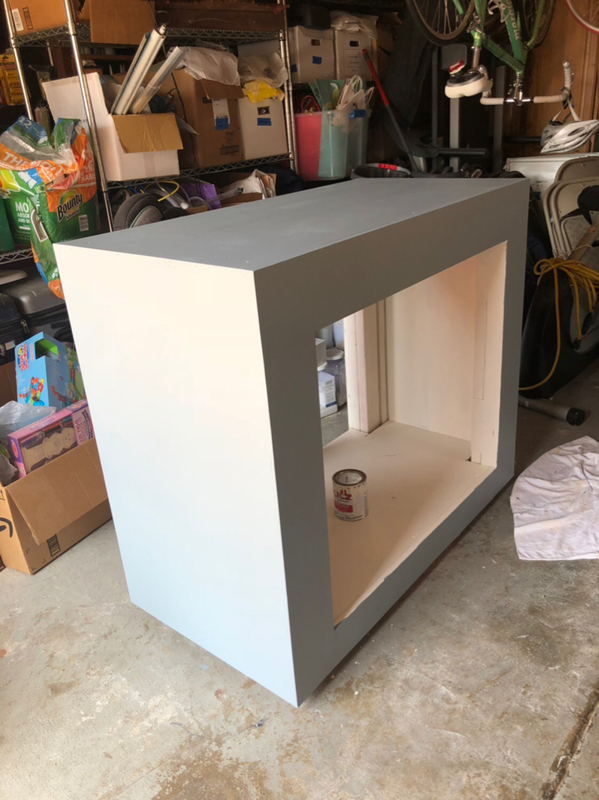 The inside is painted with kilz and outside with a matte gray to resemble the ADA style stands. I am happy with how it turned out although there was plenty of things I could have done differently. 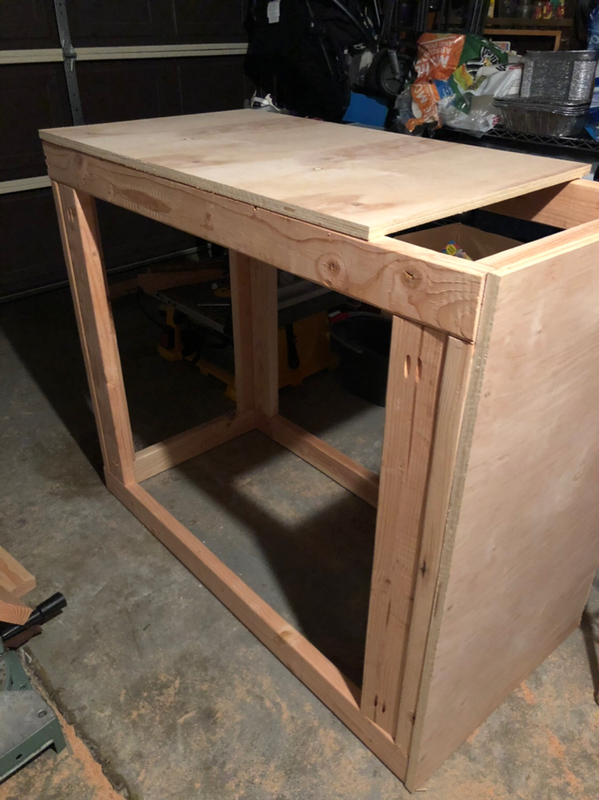 This isn’t the prettiest of builds but the goal was to keep things simple, not to overdo it, and to be as economical and practical as possible. The upside to a 4 month stand build is that I got to accumulate a lot of used equipment over that time Speaking of which, here is my equipment list. -Dosing - BRS 1.1 ML dosers that does calc and alk. - Main Lighting - 2 x Radion XR30 (Gen3). 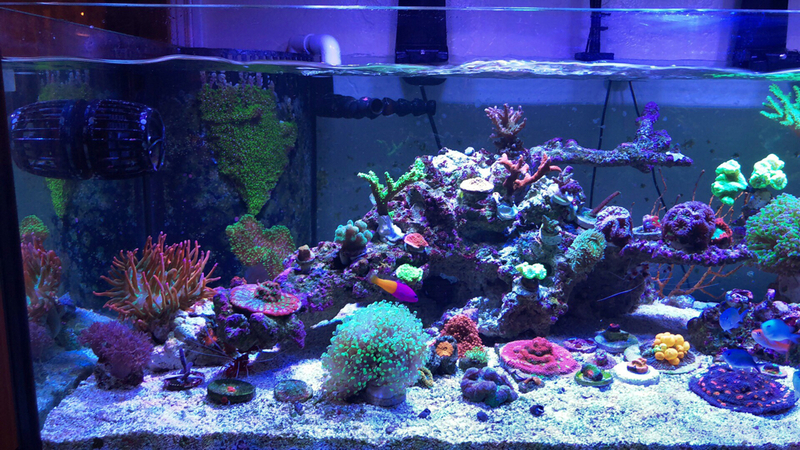 I also have a Kessil 160 right in the middle that comes on for a couple hours a day. 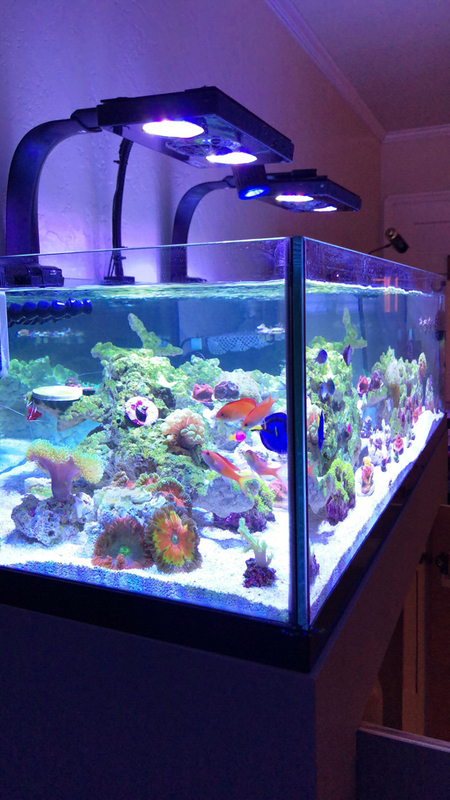 Not sure if it really helps but I do like the shimmering blue from the Kessil over the Radions. - Getting a decent amount of microbubbles/particulate matter in the tank. From what I can see, there does not appear to be any bubbles in the sump so I can only assume it’s coming from the pump. There is at least 3-4” of water above the inlet of the pump so I dont think its pulling in air from there. Any thoughts? - Still trying to figure out if I like this lighting schedule. 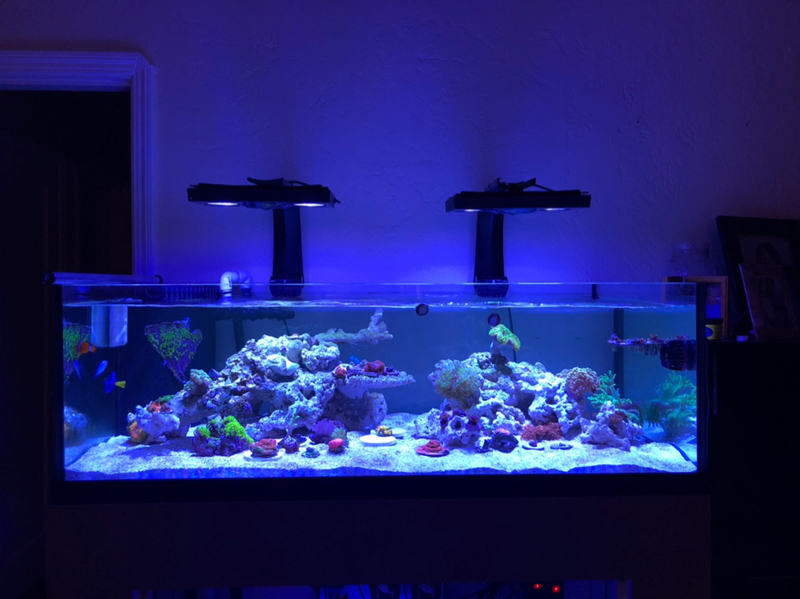 I went with the “Coral Lab” template and the AB setting. I am not getting that deep blue I had with the Kessils, although it’s a nice whiteish blue. Considering getting diffusers but that wouldn't necessarily help with the color quandary. What are you guys running and how do you like it? - I am having a hard time turning up the Vortechs without sand blowing everywhere. I have both both turned up about 50% and still notice lots of dead spots. 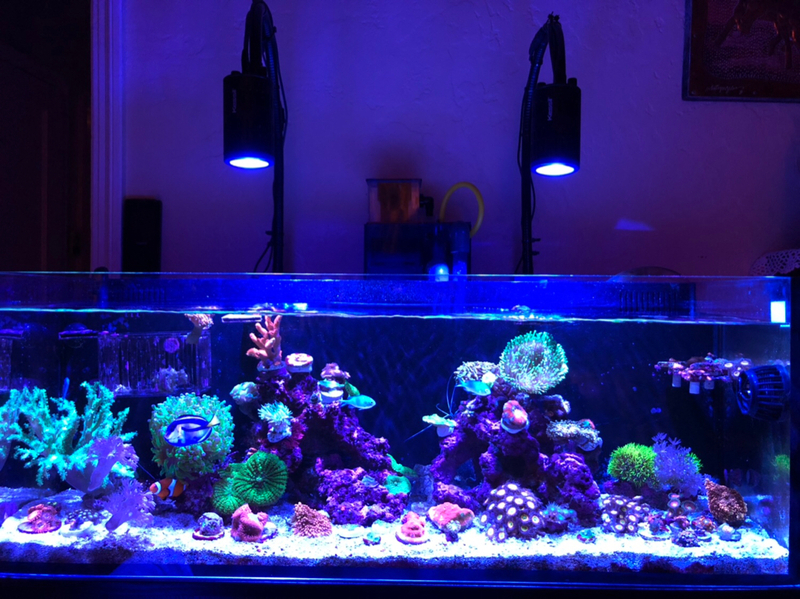 The MP10 in the back is set to constant mode and the MP40 in front is set to reef crest. I am considering trying a gyre but not sure that would really solve my sand dilemma either. I was on the fence about going bare bottom but decided on sand since I like the look better. But to be honest, I probably would have regretted my decision one way or the other. I love the ease of maintenance with bare bottom but can’t quite beat the look of a clean sand bed in my book. -I can’t seem to get chaeto to grow. I know the Kessil K80 isn't the best lighting for chaeto but I only turn the white on. I’ve never had much luck with this batch of chaeto - its been with me for almost a year and has not grown much at all. 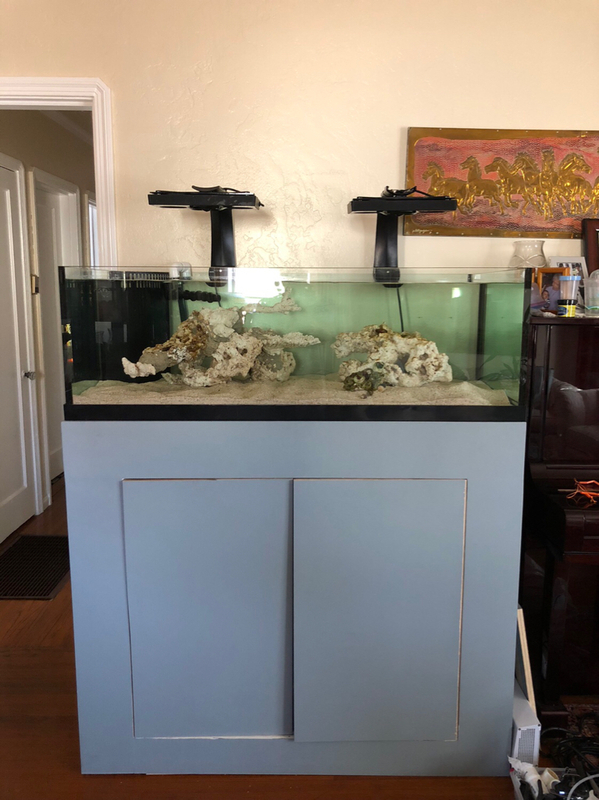 Besides that, I am trying to be patient and let the tank get dialed in before I stock it much more, although part of the stocking problem is that I am trying to limit my purchases to other reefers with established tanks. I almost sped up the setup and cycle in anticipation of the frag swap but knew that wouldn't be a good idea. On that note, let me know if you’ve got some colorful stuff for sale. 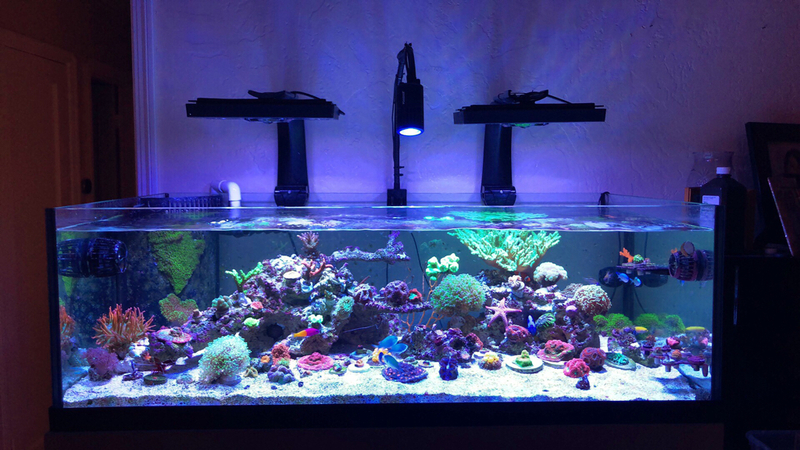 I am mainly interested in LPS/Softies but would like to obtain some of the old school corals that got me the SPS bug, e.g. tort, solitaryensis, efflo, green slimer, leng sy cap. Enjoy the pics and looking forwarding to meeting everyone in the club! Regarding the chaeto, I think having an optimized light is the most important factor, and one that until recently hasn’t been appreciated enough. Regarding the part that is too high, if it is bugging you, could you just us a bone cutter to snip off the highest branch? Rather than take everything apart. Regarding the pumps and sand blowing, it’s a real problem for shallow tanks with sand. I think gyres are good for this, with 2 units and alternating gyre mode. The sand will still blow around a little, but hopefully will blow back and forth as opposed to always in 1 direction. Awesome setup! the left side rock structure looks perfect, as for being too tall, could you just break off that tonga back piece and move it down a bit? or point it horizontally towards the right? I have a cali tort mini colony that i can hook you up with, let me know. I really like the tank and actually, I like that tongs branch on the left. It looks kind of like a ghost or something, lol. I don’t have much to add to your questions unfortunately being so new to the hobby. I could but it’s cemented in. And that’s the part I like but regret making it so high. The goal is to grow a couple SPS on that branch. Going to send you a PM about the tort. THANKS! Your build looks great as well! Our tanks are similarly sized. Thanks! And yeah, we’re pretty much the same size tank. I’m a few months behind you though. Do those rock-flower anemones drop babies? Before I moved them over to the new tank they dropped 4/5 babies but haven't seen any since the move. I had a problem in the previous tank with zoa's doing very well and then slowly melting away. Same was happening in the new tank which I attribute to lack of nutrients. Nitrates and phosphates are 0 even with heavy feeding. Chaeto doesn't grow either. I considered dosing nitrates but decided to take the skimmer offline to see how things go first. 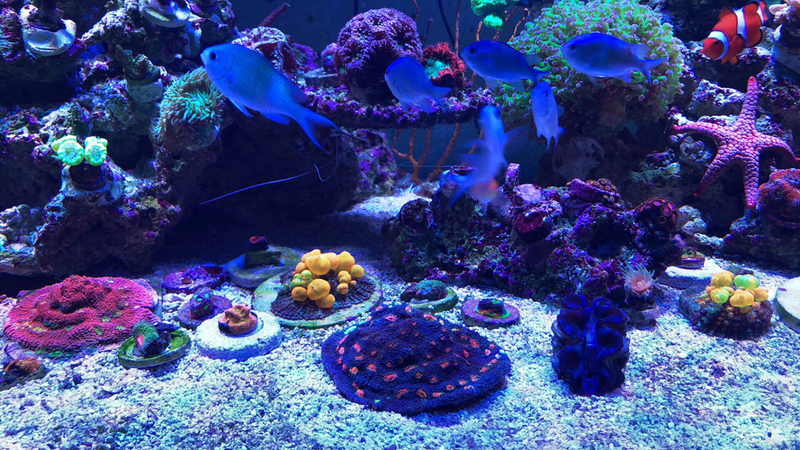 I still can’t wrap my head around the idea that zoas will slowly die in tanks that are too “clean” but apparently that’s very much possible. Anyone else experience the same issues? I’ve seen two very tiny red center anemones on the rock I got from you; one has moved and I believe still in the move; the other one is settled on the same spot. The tank looks better in person! Fill that baby up. It’s been a while so I thought I would update the thread. I started battling dinos a couple months ago. At first it was not so bad and I was able to control it by dosing hydrogen peroxide. It was controlled but certainly did not go away. About a month ago it really started to really take off so I began suctioning out as much as I could, a process which seemed to really help slow them down. I also started dosing vibrant, as I’ve read of reports of eradication using the stuff. I still haven’t quite figured out what makes them tick - some weeks are good and some are bad. In conjunction with the dinos, I did an ICP test and realized my nitrates and phosphates were extremely high (60 nitrates and 1 phosphates). Although I do test fairly often, I try and gauge water parameters based on how my corals are doing so these figures came as a bit of a surprise, especially because I don’t have any nuisance algae problems. 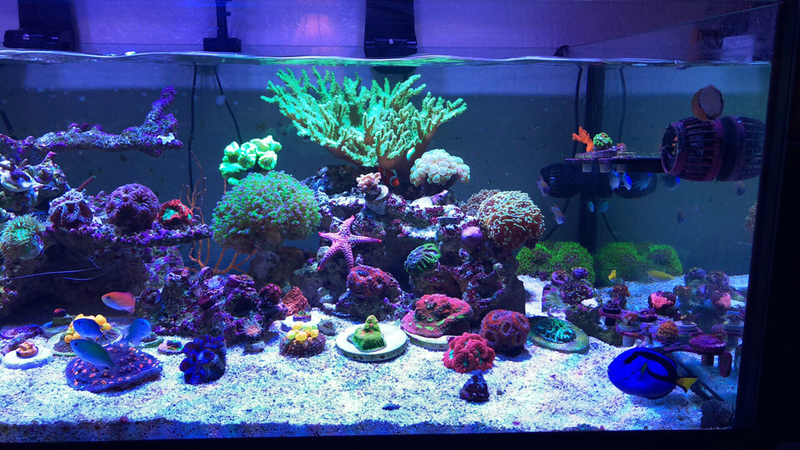 did a couple large water changes that didn’t seem to make a dent on either parameter. I am desperately trying to avoid adding another piece of equipment to the tank (eg reactor for GFO) so about a week ago I decided to start dosing nopox. Nitrates and phosphates are down slightly but nowhere where I want/need them to be. I would rather avoid using nopox long term so I need to get to the bottom of why the nitrates and phosphates are so high. 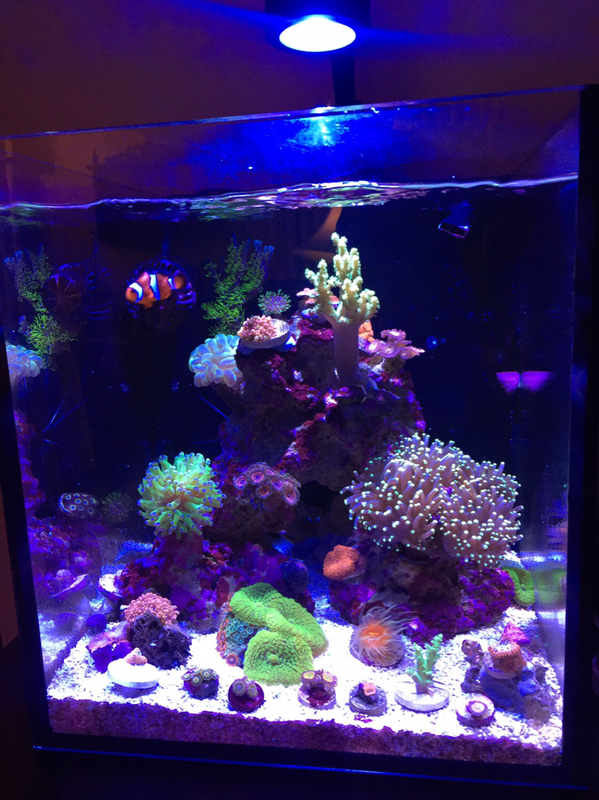 Overall the LPS seem pretty happy but I can’t for the life of me get zoas to grow - I haven’t had any melt for months but they just don’t grow. Some seem to stretch for light while others are tight but regardless, little to no growth. I attribute this to the high phosphates so hopefully nopox starts addressing that issue. I also don’t seem to do very well with discomosa mushrooms but again, hopefully the nopox and lower nitrates and phosphates help to address the issue. Overall I am happy with how things have progressed but am holding my breath on the dinos issues. I can see traces of them all throughout the tank but hopefully I’ve got them at bay for now. 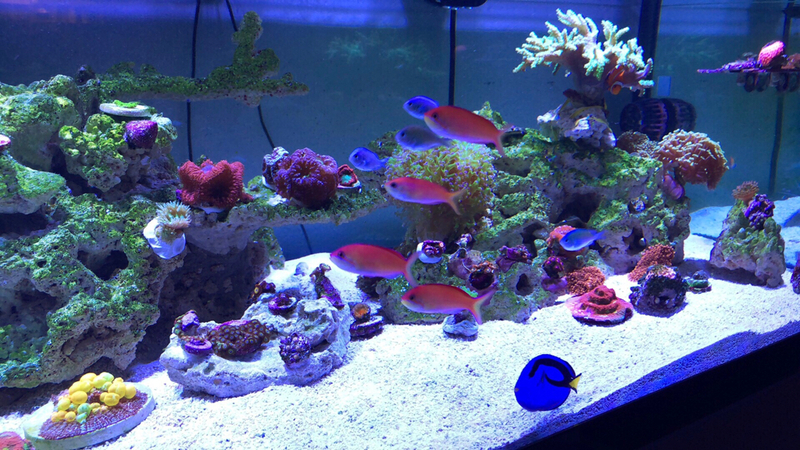 Besides the corals, I’ve since added a couple blue eyed cardinals and a 4 spot wrasse. I had 4 dispar anthias but lost 2 that jumped out of the tank. I had been putting off getting a screen (stupid me) but finally got around to picking up the BRS DIY kit. It’s not the prettiest thing on the tank but it does the job. JVU, glee and Rostato like this. NOPOX works well to naturally reduce nitrate and phosphate, but works slowly. Since you want to reduce these slowly, this is actually a plus. Just dose the suggested amount every day by hand, and test with the frequency recommended. If you don’t see any movement in a couple weeks you can up the dose a little, but then you have to be careful to actually test religiously so you don’t bottom-out your nutrients. 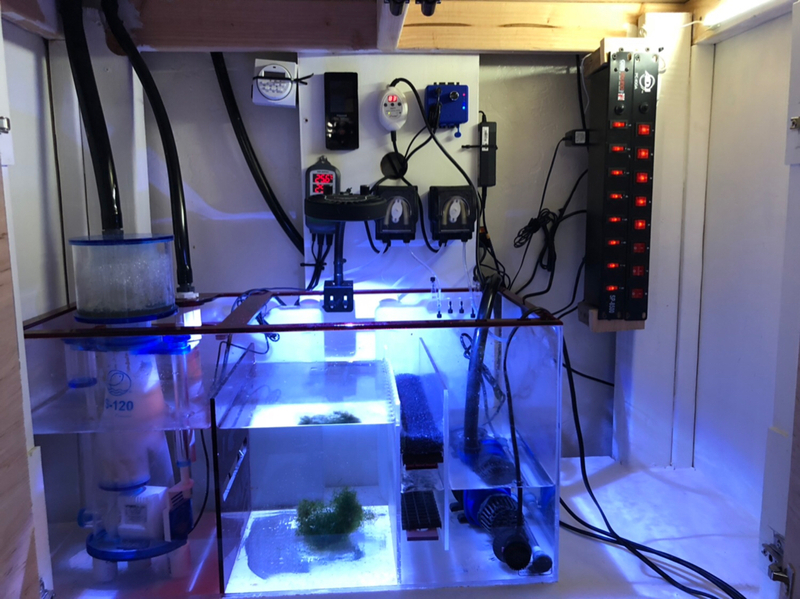 For me, my primary nutrient export is a big skimmer with a large overpowered chaeto refugium, secondary is sand siphoning and removal of less desirable critters like bristleworms and asterinas, and when I need a bit more, I do short runs of NOPOX, manually dosed. Thanks! Yeah, I’m hoping to get nitrates and phosphates down slowly. In conjunction with that I’ve reduced my feeding schedule a bit. I also have a refugium with a nice healthy ball of chaeto that has never grown. Again, hoping that getting rid of the dinos and reducing phosphates will finally kick start that chaeto.